Khun Yay (‘Grandma’), my landlord’s mother, is originally from Ayuthaya, but moved to Mae Hong Son when she was 14 – more than 70 years ago. 'It took us three months to walk here from Ayuthaya,' she explained to me, adding that part of the journey was done on elephant back. After seven decades here she’s essentially a native of the city, and even used to earn extra money by selling Thai Yai/Shan sweets. 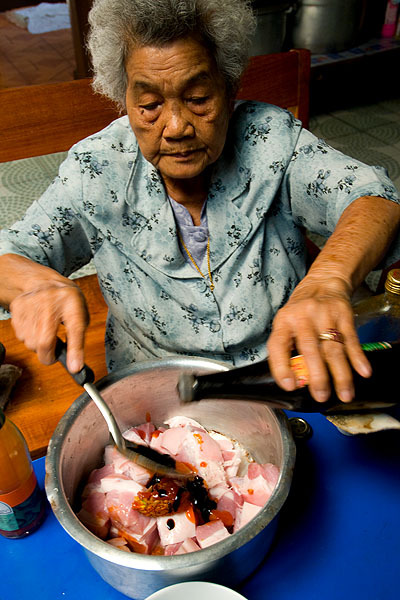 She can also make the local savoury dishes, and everybody in the family agrees that she makes a mean hang lay. 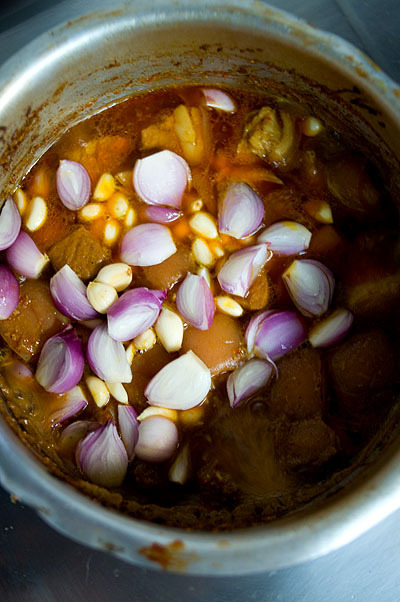 Kaeng hang lay is a rich curry based around pork belly (hang lay is a corruption of the Burmese word for pork curry). 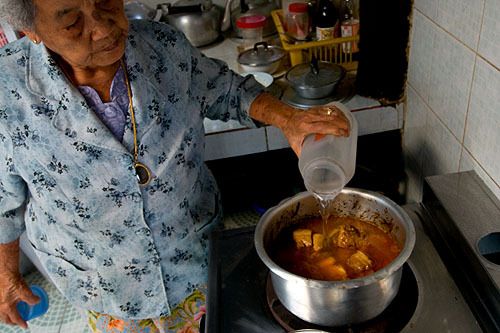 The dish is found all over northern Thailand, and because it’s easy to make in large volumes, is often associated with communal eating. 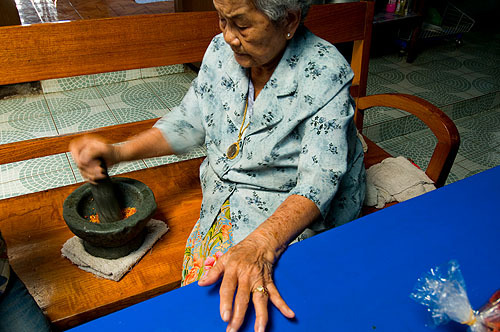 'If you come during a festival they’ll make the dish using tens of kilos of pork,' explained Khun Yai, while pounding the curry paste in a mortar and pestle. Her version is a variant on the local version of the dish that usually forgoes the chili paste altogether (she decided to include a basic one here), and which also highlights the local obsession with tomatoes (here in the form of ketchup). 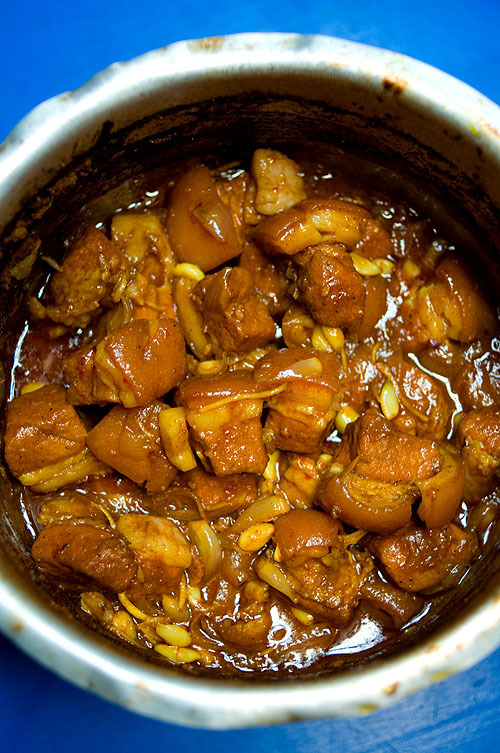 She explained that if you substitute chicken for pork, and leave out the ginger, tamarind and garlic, you’ll have the recipe for kai oop, another popular local curry. *Known locally as phong maksalaa, this is a spice mixture used in Mae Hong Son. reduce heat and allow to simmer until almost all the water evaporates, the fat rises and pork is tender, up to two hours. If water evaporates too quickly, add more. and allow to simmer until tender, about 10 more minutes. 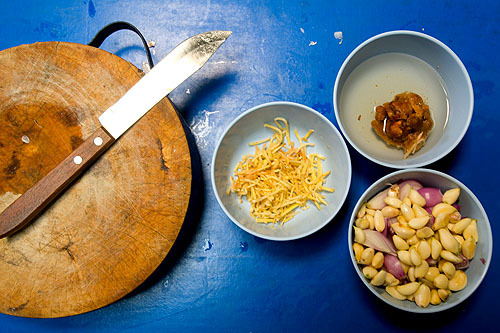 Season to taste with tamarind pulp, sugar and salt, and serve with hot rice and an acidic salad; Khun Yai suggested a local salad of green mango.